CBD Oil Review rates Jeff's Best Hemp! with three stars because it qualifies for the Quality, Mission & Innovation Badges. Jeff’s Best Hemp has been in the game for quite a while and is one of the original providers of raw (unheated) CBD hemp oil. Due to the lack of heat or chemicals used in the creation of their hemp oil, each tincture is a 40/60 blend of CBD/CBDa (offering purported advantages over straight CBD). Although we hope to see Certificates of Analysis for laboratory testing for Jeff's Best Hemp published in the near future, they are available upon request to any customer who requests them from the manufacturer at any time. Jeff’s Best Hemp! still shines for their commitment to purity and originality. Jeff’s Best Hemp! has been in the business of hemp for quite some time, and founder Jeffrey Von Stetten (a cancer survivor and certified nutritionist) takes health and healing very seriously. He offers “health empowerment consultations” online for those suffering from disease or wanting to optimize their wellness the natural way. This guy knows his stuff. The Jeff’s Best Hemp! dedication to purity is apparent, as they go to great lengths discussing the laboratory testing to demonstrate the absence of contaminants such as radiation, gluten, fungicides, pesticides, herbicides, microbials and heavy metals. Unfortunately, since they do not post these tests, we cannot award the Safety Badge, but we believe their CBD oil is indeed safe and free of chemicals and contaminants. Although they offer a myriad of products including educational books, hemp seed protein powder, and essential oil blends, their Raw Organic Living CBD Rich Hemp Oil tinctures are the real stars. The CBD tinctures come in just two sizes; the 100mg size costs $34, while 200mg will run you $59. This product is unique as it is unheated (raw) and as such contains a 40/60 blend of CBD/CBDa (CBDa has many purported unique advantages over straight CBD). This is pure, unadulterated CBD oil in its natural state combined with the company’s own organic, raw, cold, and unfiltered hemp seed oil. For the cherry on top, Jeff’s Best Hemp religiously avoids their product touching anything plastic and uses no solvents, extracts, heat, or chemicals in the creation of their ultra-pure CBD oil. Founder Jeff’s steadfast commitment to wellness and natural living is evident in every facet of the company. And this commitment naturally aligns with one of sustainability, another one of our qualifiers for the truly great CBD vendors. Bottom Line – Jeff’s Best Hemp! is the real deal: a highly qualified team with a genuine mission, deep-seated values, and phenomenal CBD products. If they post their independent lab results and tell us a little more of how they are involved in charity, we foresee them becoming a five-badge contender. Badges For Jeff’s Best Hemp! 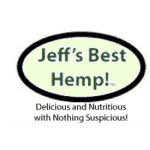 Jeff’s Best Hemp sources organically grown, Fair Deal, and Test Pledge Certified agricultural hemp from Canada. Jeff’s Best Hemp was one of the first companies to offer raw, unheated CBD oil to the public.